Abodes that recall ancient magical charm, the Trulli still exert a peculiar charm and attract visitors from all over the world. Stay in a trullo is a dream come true today! 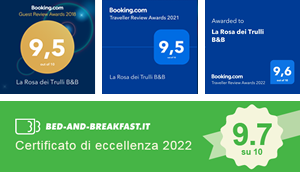 The residences of the Bed & Breakfast “ La Rosa dei Trulli “are spacious, comfortable, and equipped with all comforts: including Internet connection, satellite and digital terrestrial. The furniture in poor art and wrought iron, reminds the atmosphere that breathed a time in these homes. The residences, completely independent, are composed of one, two or three rooms and can accommodate up to five people. All the facilities, with independent entrance, are equipped with kitchen with stove, fridge, oven, dishwasher and washing machine . The change of linen is carried out twice a week.